Sarah Dwyer of Chouquette: At last - my first guest blogger - My mom! Chouquette - chocolates and confections. Follow my journey of starting a new business. 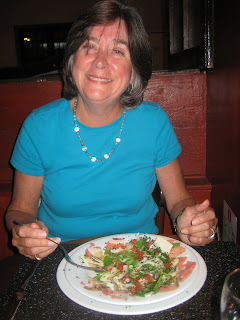 At last - my first guest blogger - My mom! 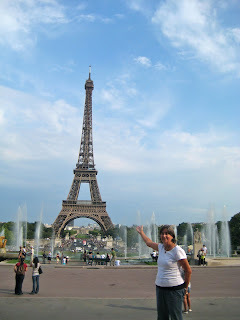 Here is what my mom wrote about her visit this summer, I didn't change a thing, except add some of our photos. The two month delay is completely my fault! Oh, no…I am here on the wrong day or the wrong gate. She handed me another pass and told me to go ahead. Well, after I boarded the plane I was directed to business class…champagne, a tasty meal, dessert and French wine. Because of the comfortable accommodations I was able to relax and take a long nap before landing. This is going to be a great trip. Sarah was patiently waiting as I finally collected my luggage. After two months, it was great to give her a giant hug. So glad she came to meet me to lead me to her apartment. It was about 92 degrees in Paris that day and by the time we got there we were both dripping wet. We dumped the luggage and hiked to the top of Monmartre to meet her departing friends, Lauren and Lisa. On the way back, Sarah and I stopped at the grocery store for some necessary supplies, wine, fruit and cheese. As the girls were off to London on the EuroStar, Sarah and I walked to the Metro. Destination – Marmottan Musee. The Museum possesses the world's largest collection of works by Claude Monet. For this we must thank Michel Monet, the painter's younger son. There is one of Monet’s palettes replete with paint marks from the caps of the paint and the painting that gave Impressionism its name, “Sunrise”. Finally, after a long walk towards the Eiffel Tower (sort of following Rick Steve’s recommendations), we headed to the Trocadero to catch the Metro home. Later we feasted on Sarah’s signature chicken and salad accompanied by fine French wine and bread. On Sunday, Sarah walked me to her favorite local street Rue Martyrs directly under Monmartre. She shrieked with delight as she discovered that Rose Bakery was open again. Many shops and restaurants are closed in August in Paris. Had a totally filling and healthy breakfast with a latte for me…first one since I arrived. They have an interesting system billing system. They just asked the us what we had and they rang us up…total trust. 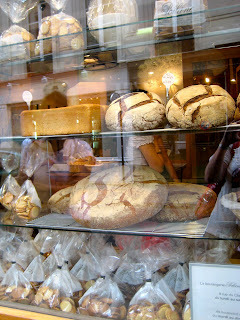 We walked up and down the street checking out the shops especially wine and pastry. In the afternoon, Sarah insisted that I take a tour of Roland Garros. By myself on the Metro…I did not get lost. And what a great tour! We were shown the interview area, the press area, both locker rooms and walked out to Chatrier the way the players do. The court was left as it was after the Soderling/Federer final. The net was slack but the marks the players made was still in the clay. It will not be played on or dressed until April of 2010. Exiting I took a wrong turn and ended up three metro stops south of where I wanted (about 2 miles out of the way)…but I got home OK. While I was gone, Sarah had done her laundry (lost her favorite pink tee) and cleaned her apartment. Onto the Metro to the Marais for dinner at Le Marche (Sarah’s favorite). Great atmosphere except for the loud American family behind us. The French speak so softly so as not to disturb others. Great mussels, ravioli, a huge portion of lamb and a lovely chocolate dessert. But most of all, great company!On Friday we were thinking about a trip to Chartres but decided to stay local to visit Musée de l'Orangerie in the Tuileries Gardens. The “Nymphéas" panels by Claude Monet does not disappoint. Both rooms are mesmerizing…the panels are truly extraordinary. Wondering how Monet could enlarge the scenes while maintaining perspective. Walked through the Tuileries Gardens. Wandered through Les Halles to look for cooking equipment. Checked out Dehillerin, which is famous for its cooking supplies. Did not find the thermometer I wanted for Stefan and the microplane was too expensive. Went to several other stores looking for horseradish. Sarah cannot find it in Paris. Then Sarah showed me a store, which only carries frozen foods. It is Picard Surgelés. Amazing the selection. Wonder how it would go over here? In the evening Sarah whipped up a little chicken salad from last night’s leftovers. Of course, some wine cheese and bread. On Saturday, we headed out on the train from Montparnasse to Chartres, a town southwest of Paris. The cathedral Notre Dame de Chartres is considered to be the finest example of gothic architecture in France. My history professor, Sister Frances Theresa, affectionately known as “Fan Tan” always mentioned it as one of the sites to visit. Wondering why she did not insist that we visit in 1964… It is truly a marvel and even more. The cathedral has much of the original stained glass and is in the process of extensive renovation. It will be incredibly beautiful when the renovation is completed. Sadly, that will be many years perhaps even more than the 60 it took to build. After touring the cathedral we walked to the old town where we found a lovely restaurant “L’Estocade”, along the river with outside seating across the street from the main restaurant. We shared a salmon tartare appetizer which was in Sarah’s words, excellent with a sprig of dill. We each ordered a man course and shared (fish and pork). The food was very nice but, it was the setting and the wine which made the afternoon. Caught our train back to Paris and settled on a cheese plate for dinner. An early night. Monday was a busy day. We headed for the Left Bank. Our first stop was Le Cordon Bleu to collect Sarah’s certificate. She showed me the kitchens and the hallway with Julia’s photo. Now I can picture her in class. From there to the Poilane Bakery with a visit to the underground brick ovens, meeting a baker with no shirt, seeing the bubbling leavener and water and the little baskets holding the rising boules. It was sweltering down there. Too bad, no photos allowed. We bought some bread there to make croque monsieurs. Around the corner was a little hat store where Sarah love a little velvet hat…too many euros. Then a light lunch around another corner at Le Sevres Raspail. We shared a quiche and salad. Off to the Luxemburg Gardens where we saw so many Parisian playing chess and others just enjoying the gardens. I directed us the wrong way to the metro, getting us caught in a downpour (first serous rain in Paris since Sarah arrived). We shopped for ham, cheese and more wine. Anxious for our croque monsieurs. Bought tomatoes and artichokes for a salad. Another great meal…feel like I am eating my way though Paris! So much walking could balance out the effect of the eating – I will see if my clothes still fit when I get home. After dinner we went into the city to see Paris at night. Sarah was searching for a “salty caramel” Berthillon ice cream cone on the Ile Saint Louis. No luck with that flavor so she settled on coffee. I never seek out ice-cream but I would go back. Small and delicious. Waited on the bridge to see the Eiffle Tower sparkle with little lights on the hour and then we headed back home. Feeling sad as tomorrow is the last day. How fast it has come. How much fun it has been. Tuesday we metroed to the Place d Republique, site of my hotel in 1964 while on a tour from the College of Notre Dame. It is still a hotel. Was called the Hotel Moderne. 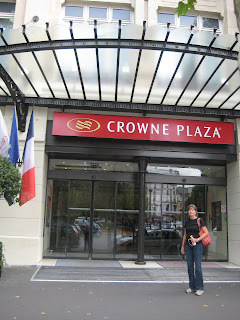 Now it is a Crowne Plaza. We wondered if they still have the bidets..where we soaked out feet and the toilets with the chains! Walked from there to the Marais. Feeling hungry, we stopped to have lunch at Creperie Suzette. Shared a salad and a crepe. I had a glass of wine while Sarah enjoyed a Coke (Coke tastes different (better? )…but it costs more than wine!). After lunch we visited Le Carnevalet - Museum of the history of Paris and its free! The most interesting part was about the French Revolution and Napoleon. It is a fabulous building with lovely gardens. That evening Sarah and I walked to Montmartre for dinner. She had read about a small restaurant and did not know if they were back from vacation. Turns out it was their first night back. Chez Toinette was wonderful. Best yet, even thought they did not have the steak. We loved the food and the waiter who looked like George Clooney. Wednesday I packed up, Sarah walked me to Gare du Nord and sent me off to Charles de Gaulle. Upgraded to economy plus…not business class this time. Hoping that I can get back while Sarah is still in Paris. We have had two great visits 2000 and 2009. Looking forward to Reims and champagne. Thank you, Sarah. Click here to see all the photos from the trip. Having lunch in Chartres and our dinner at Chez Toinette. Making simple dinners for us to share. Seeing the Monets at the Marmatton together. Shopping at the grocery store and showing off my knowledge of cheap white wine. Just having my mom here for a week and getting all the hugs I wanted. Thanks, Mom! Where's the picture of George Clooney?? New york post home delivery. How steph stays informed about world events. I guess this is like a mexican hot chocolate cookie. it has a nice kick and needs a glass of milk to wash down bc it is so fudgy. Guess How Many Corks are Here? It is has been a busy 6 months!